Puerto Rico has made a wave of arrests of doctors who officials say are practising with false licences. Arrest warrants were issued for at least 88 doctors whom officials allege gained their credentials through fraud or bribery. The arrests were made by agents of the US Food and Drug Administration (FDA). The doctors are accused of bribing officials in the US Caribbean territory to change exam results so that they would be allowed to practise. Interim US Attorney Rosa Emilia Rodriguez said most of those suspected had studied medicine in the Dominican Republic, Mexico or Cuba. They then had to take a test in Puerto Rico in order to be able to practise as doctors. 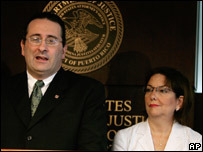 The arrests are linked to allegations that members of Puerto Rico's medical licensing board took bribes of as much as $6,000 (£2,900) to raise the marks on exam papers so candidates would pass. Officials said that if the doctors, many of whom are believed to be working in hospitals on the island, had prescribed drugs they could face further charges. Correspondents say that the country's medical licensing board has implemented new safety measures since the allegations first surfaced, about a year ago.